The proverbial rebel of the Supreme Court of India, Justice J. Chelameswar officially retired on Friday after a nearly seven year long tenure at the Supreme Court. In several interviews given to different media houses after demitting office, Justice Chelameswar spoke nonchalantly, but candidly about various issues plaguing the judicial system of the country. Notably, in his interview with India Today's Consulting Editor Mr. Rajdeep Sardesai, he asserted that he held "no regrets whatsoever", but refused to be remembered as the Judge who symbolizes the disquiet in the country's higher judiciary. He told Mr. Sardesai, "Every difference of opinion is not disquiet... When Judges write dissenting opinions, do you call it disquiet?" However, in another interview to Mr. Ajmer Singh of The Economic Times, he said that he wants to be remembered as "a man, who loves democracy and liberty, a judge who tried to uphold the constitutional values." Speaking to Mr. Singh, Justice Chelameswar acknowledged the fact that judges can be politically influenced and said, "To say that judges are not touched by politics, I think is not an honest statement. And, mind you, I am not talking party politics. The question is how dispassionately can judges handle the current political events. Once you take an oath to uphold the Constitution, your past connections or inclinations, should not weigh in your decision making process." He similar statements while talking to Mr. Sardesai as well. When questioned about the delay in Jayalalithaa's case, he said, "The question is not whether anybody is influenced or not. It’s always said by the judiciary that ‘justice should not only be done but also appear to have been done.’ And the chequered history of that case, I suppose certainly leaves much to ask." Quite expectedly, Justice Chelameswar was repeatedly asked about the unprecedented press conference held in January this year by him and three other Apex Court Judges. Speaking to Mr. Sardesai, he said that he had "great respect" for senior lawyers like Soli Sorabjee and Fali S. Nariman who were critical of the judges choosing to come outside the Supreme Court. However, he countered: "A Lot of unprecedented things have happened in the Supreme Court in the last few months. Did it ever happen in the history of this court that a constitution bench assembled at the 3:30 in the afternoon to decide any matter? Constitution benches are too serious. Quite a few matters referred to Constitution benches are pending in this court for almost a decade. None of them were ever taken in the Supreme Court. But a particular matter within 24 hours was referred to a constitution bench. And a bench assembles at 3:30 in the afternoon. Did it ever happen earlier? And as per the reports (as I was not in the court hall), after the bench assembly 7 seats were kept in the court hall, two were removed. Only 5 judges sat. It was unprecedented. Naturally, unprecedented event leads to unprecedented consequences and events." On being asked about his inspiration for the conference, he claimed that there were "systemic problems" that they tried to sort out, but failed. "Therefore we thought we owe a duty to the nation to inform that things are not in order," he added. On being asked whether the public faith in the higher judiciary is misplaced, he told Mr. Singh that all his efforts were pointed towards preserving the institution and strengthening it "by creating a greater degree of credibility which can only come through transparent functioning". Responding to a question on allegations of him taking a political stand, as CPI leader D. Raja met him on the day of the conference, Justice Chelameswar said that what needed to be looked into was the other closed door meetings happening with the people in power. "The day I held the press conference along with other colleagues, my tenure was a matter of few more weeks. It is not important who I met or D Raja met. We are not running the country. He is not in power. The more important question is- Who are the power holders or people who are running the country meeting behind closed doors?... I have not seen such closed door meetings happening but I have heard rumors," he said. Speaking to CNN-News18, Justice Chelameswar asserted that the system of distribution of cases in the Supreme Court requires "rationalization" and a definite process for setting up the Constitution Benches. He in fact emphasized on the need to formulate a process consistent with the constitutional norms that the Apex Court has been preaching to all other organs of the State. He, however, clarified that he had never disputed the principle of there being a "master of the roster", and claimed that the issue is the way in which the power is exercised. The second judges case makes it clear that there are areas where the opinion of the Collegium is conclusive like suitability for the job. The government can't decide that. Now, one can be a brilliant lawyer, but a scoundrel, debauch, undischarged insolvent. That’s for the government to take a view." While refusing to say much about the delay from the Supreme Court collegium's side in reiterating the elevation of Chief Justice of Uttarakhand High Court, Justice K.M. 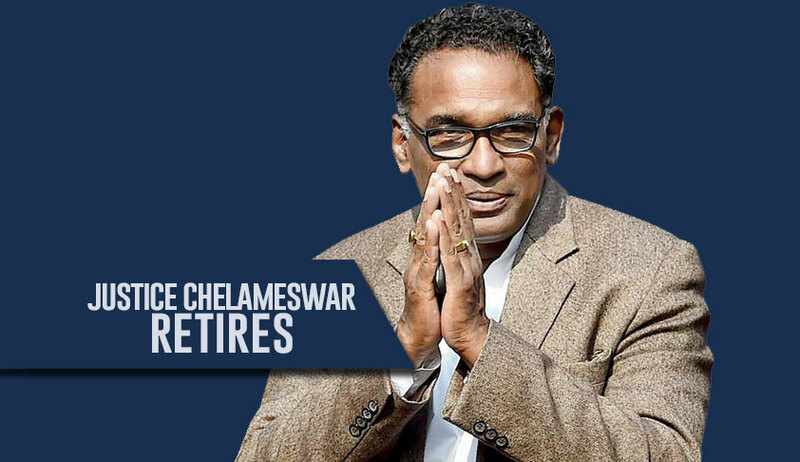 Joseph to the Supreme Court, Justice Chelameswar categorically stated that none of the reasons given by the Centre for rejecting his candidature hold water. While the Centre has indicated the possibility of putting in place a national-level entrance exam for judges of the subordinate judiciary, Justice Chelameswar feels that this might not be the solution. "No, so long as the constitution stands as it is. (Because), you will be contributing to the creation of a monolithic state…in everything all-India, power slowly passes on to the government of India. The states will become irrelevant or minor players in the federal system. From that point of view, I don't agree. That they must have an efficient mode of recruitment is a different story. But an all-India examination is no solution," he was quoted as telling Mr. Singh.